The Johnssons were making a nostalgic stop at Sligo Church as they wrapped up a two-week trip east from their home in Loma Linda, California. 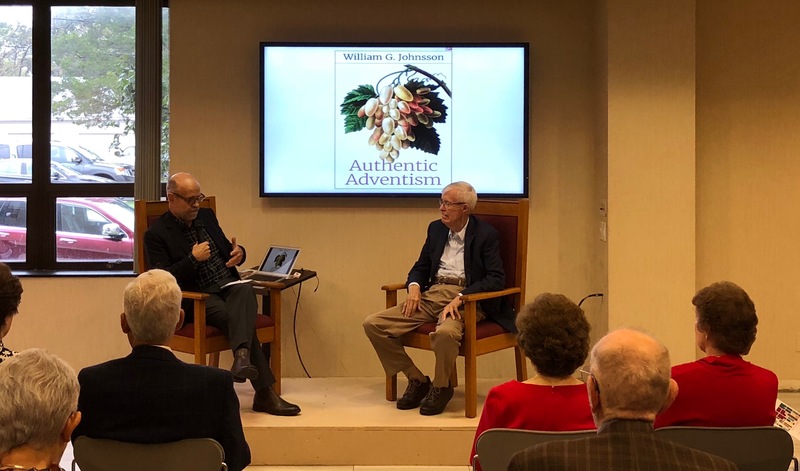 The appearance comes as Johnsson’s second book in a little over a year, Authentic Adventism, follows on the heels of his best-selling Where Are We Headed? Adventism after San Antonio. “Thank you, Noelene!” someone said from the audience. “You’re the Ruth Bader Ginsburg of Adventism with the millennials,” Sandefur said to laughter. Someone in the audience called out, “The Notorious W.G.J!” to more laughter. The question of how these latest books have changed the Johnssons’ lives came up. “I never would have thought of the effect,” said Johnsson. “When we go out walking in Loma Linda a car will pass by, stop and back up. ‘Are you Bill Johnsson?’ they’ll say. ‘Thank you for your book. Our church is reading it right now.” The first book has been translated into four languages and more translations are planned. “That brings up another question,” said Sandefur. “Why should I remain an Adventist? Johnsson bowed his head for a long moment. He didn’t speak at first; his hands were folded in his lap. He looked weary. He seemed to be choosing his words carefully. Editor's Note (Oct. 9, 2018): Dr. Johnsson's quote regarding the music at Crosswalk has been updated, per his request.